In the heart of Gandia, right in front of the beach, we see the symbolic RH Bayren & Spa Hotel. A four-star hotel which has become a complete benchmark in the hotel sector on the east coast of Spain, thanks to: its unbeatable location which is next to the seafront; its incredible views and because of providing its guests with a high level of service, together with its passion for detail. The hotel has seen its image redesigned and its capacity increased in order to improve its facilities with four new floors added with 16 rooms in total. The architect, Ainhoa Hernández, who has overseen the design, has found the perfect match for this project in none other than KRIONTM Solid Surface which has brought this project with diverse building requirements to life. 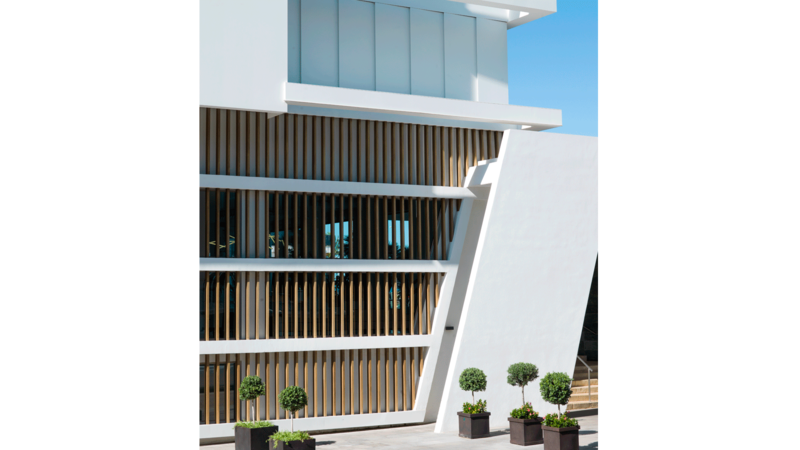 The hotel catches the eye because of its minimalistic and modern design, accentuated due to the pure white colour from the KrionTM K-Life Lux 1100 series,material which has been chosen to build a 256m2 ventilated facade, which creates an amazing lighting effect. Technically speaking, the material offers features which make it ideal for being installed in outdoor areas close to the beach, such as: its resistance to sunlight, the outdoors, saltpetre and sand erosion. To these features, the innovative K-LIFE technology is added. This is integrated into the material, since it not only repels but it also eliminates every possible type of microorganism, dirt and surface mould. As well as that, it purifies the air and increases the facade’s durability and aesthetic. The material, thanks to its thermocurvable possibilities and invisible joints, allows limitless surfaces and creative shapes to be designed. As well as that, KRIONTM offers a wide chromatic range of sheets which greatly increase the aesthetic possibilities for its custom-made application in every type of project which looks for uniqueness and emphasis. The expansion and the new image of the RH Bayren & Spa Hotel in Gandía, consolidates it as a place full of commodities and innovations for all those tourists who want to take it easy and enjoy the splendid beaches in Gandia.